The patented network audio configuration allows different audio to be broadcasted to each network audio device, so different bell schedules can be set for different areas and announcements can be targeted to a single network audio device. The network audio devices can be connected anywhere on the network and could be used, for example, to send individualized announcements to a classroom. Each network audio device is then connected to speakers or to an amplifier driving multiple speakers. This configuration is ideal for schools with different buildings or areas of buildings on different schedules. The configuration is also ideal for stores which would like to broadcast audio to different areas of the store. Typical configurations with the network audio devices include installing a network audio device in each classroom or using 70 volt paging amplifiers and speakers to reduce cost. With a network device in each classroom, pages and bell schedules can be targetted to specific classrooms. 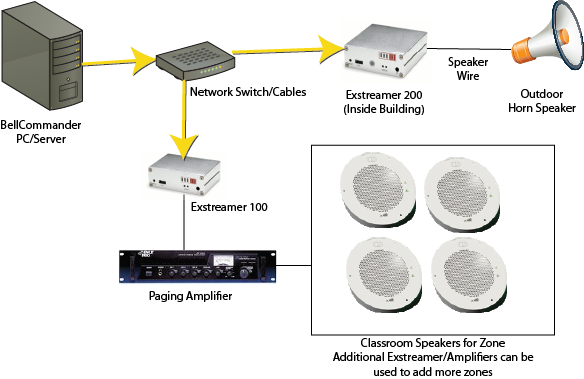 With a 70 volt paging amplifier, multiple classrooms can be grouped into a single zone with an Exstreamer 100 and amplifier driving speakers in each classroom which lowers the total cost of the system.